People are concerned about robots. Ever since a computer system defeated chess champion Gary Kasparov 20 years ago, public perceptions of progress in artificial intelligence (AI) research have been defined in terms of high-profile competitions pitting human against thinking machine. Anxiety is high about what the ultimate consequences could be. In the wake of Deep Blue’s triumph, other machines powered by AI have racked up momentous victories against human opponents in the game show “Jeopardy!” and most recently, against the world champion Go player. The latest version of Google’s AlphaGo software taught itself to play the strategy board game without any human help at all. The debate among leaders, technologists, futurists, and employees of all stripes is on the profound impact AI will have on our workplace, our societies, our lives. The scale of this impact is hotly debated. Could machines replace us? Could they actually take over? Others believe the rise of automation represents a veritable utopia made possible by smart machines. Optimism is a free stimulus in any country. In that spirit, this evolution could create massive potential for the human race. Any way you look at it, one thing is clear: There is nothing to be gained by hand-wringing about a dystopian future that we have the power to avoid. Let’s create the future we want to live in. Even in divisive times like these, we see human qualities such as ingenuity, kindness, innovation, and creativity rise up, take hold, and gain unstoppable momentum. It is possible to create a world where AI benefits humanity, where automation frees people from dangerous, repetitive tasks and affords us the freedom to focus on activities that only humans can perform – with empathy, moral judgment, and love. Working with careful foresight, global technology leaders have the responsibility to help ensure that smart machines work in harmony with humans, rather than in competition with them. While we need to acknowledge and mitigate risks – for example, by retraining workers displaced by the next wave of automation – we must also realize that AI can deliver benefits for all mankind. Reflecting this, leading industrial manufacturers are exploring options to deploy collaborative robots or “cobots” on the factory floor. Their reasoning is simple. Robots are consistent, reliable, and do not get tired, but they don’t improvise well. Changes on the assembly line require painstaking reprogramming by humans, making it hard to quickly alter what a factory produces. The solution, say researchers, is a facility that uses AI to orchestrate the factory of the future, programming robots and handing out assignments to the humans working alongside them. We will need thoughtful planning if we are to avoid the potentially negative impact technology has on society. Together, we must address the potential threat of large-scale alienation leading to the rise of a fractured populace. Leaders in government, the private sector, and education must work together to ensure that young people have the skills needed for a digital marketplace and that those already in the workforce can adapt to new requirements. 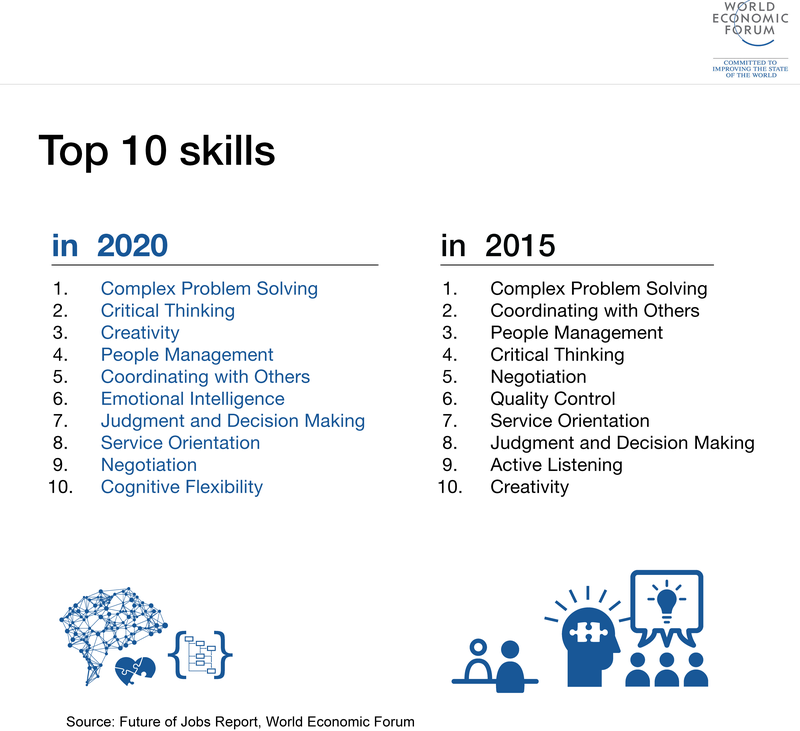 It is already clear that reskilling and life-long learning are the new normal. Businesses will need to operate with transient, contingent workforces of all ages. While AI has the potential to change many aspects of our lives, there is considerable disagreement among experts on how many jobs could be automated through AI. A small percentage of current jobs are susceptible to full automation, but almost every occupation could be partly automated. The tasks most prone to automation are predictable, routine activities such as data collection and processing. But we should remember that AI also contributes to human safety by taking over jobs that are too difficult or dangerous for people. Throughout history we have seen that tectonic technology advances do lead to employment shifts, but have consistently resulted in the creation of new, modern jobs – often in greater numbers than those displaced. Most industry analysts agree that AI will be a core driver for economic development. Gartner predicts AI-enabled tools will generate $2.9 trillion in business value by 2021, while PwC believes AI could potentially contribute almost $16 trillion to the global economy and boost GDP growth by up to 26 percent by 2030. Some estimates suggest companies could save an astounding $3 to $4 trillion annually through AI-enabled task-based automation. The benefits of AI for companies go far beyond cost savings. They also mean more innovation, improved forecasting, optimized operations, more personalized customer services, and enhanced user experience for consumers. As in any technology transition, we must never lose sight of the human element. There are some things even the smartest machines cannot manage. Machines don’t dream. Machines don’t set goals and are not responsible. Even when trained with high volumes of data, machines can only learn from the past, they cannot imagine the future. Fortunately for us, life and business are not purely mathematical chess matches. Uniquely human capabilities such as flexibility, creativity, curiosity, and emotional intelligence will always be necessary to run the intelligent enterprise. There is no room for small dreams. We need to conceive of unimaginable possibilities and then get to the hard work of turning them into reality. When I look to the future, there is a real need for thoughtful debate on the societal impact of AI, so the disenfranchised do not get left behind. This is our modern responsibility. But the world’s greatest challenges are also our greatest opportunities. Only when we dream big can we rise to our full human potential. This story originally appeared on the World Economic Forum website. Bill McDermott is Chief Executive Officer and a member of the Executive Board of SAP, the world’s business software market leader with more than 296,000 customers in 190 countries. He leads the company’s 75,600 employees and more than two-million-person ecosystem in executing SAP’s vision and strategy to make the world run better and improve people’s lives.